This week’s CWL comes a day late, but hopefully not a dollar short. It’s been a hectic week at DLRC handling some internal clean-up and sorting through several massive raw deals that were purchased in recent weeks. While these take a lot of time to sort, it takes us back to our roots in actually getting to handle the coins once again. There’s just something about holding the actual items and not the plastic sometimes! Don’t get me wrong, we respect the plastic and only sell items that are certified through our website for the protection of the customer, but it’s still a lot of fun to make our way through these items on occasion. All of that being said, it’s a beautiful day here in Virginia Beach, and we’re looking forward to enjoying a lovely weekend so we’ll pause for now and hope to hear from you next week! 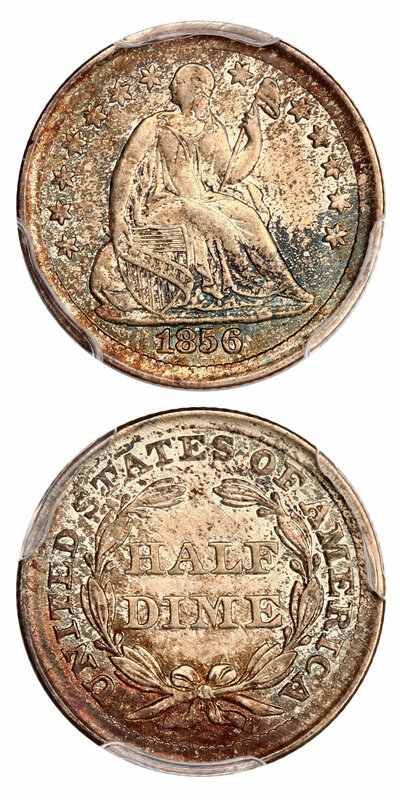 Why we love it: A scarce Dahlonega Mint Half Eagle in all grades that becomes especially rare when found in Mint State grade. This piece is incredibly lustrous and offers surprisingly nice eye appeal with fewer marks than you’d expect from its MS61 grade, making it perfect for branch mint gold collectors. From a low mintage of just 37,917 coins struck in which there are only six other Small Date varieties graded finer by PCGS. Value: A historic branch mint issue that is so rarely seen on the market that the last auction record of a PCGS graded example was over 16 years ago. The PCGS Price Guide does has this coin valued at $16,000 with the CPG Value at $15,500; however, it is available in this week’s auction with the reserve set fairly at just $15,000. Why we love it: A silky gem example of this scarce early issue Walking Liberty Half Dollar. This beautiful Walker comes without any notable blemishes and pretty light gray surfaces with plenty of luster beneath. It possesses a faint golden glow throughout with lovely darker rims that brighten the focal points of the coin. It comes from a lower mintage for the series of just under one million coins struck in which just six others are graded finer by PCGS. Value: The PCGS Price Guide Value for this coin is set a bit high at $21,500 but on the other hand, the CPG Value’s evaluation is fair and accurate at $15,700. Our best price via Make Offer blows away PCGS’s evaluation and even undercuts the CPG Value as this scarce lovely gem Walker can be acquired for just $14,000. Why we love it: The High Relief Saint Gaudens is one of the most popular and beautiful designs across all of U.S. Numismatics. This stunning CAC approved example of the Flat Edge Variety possesses the eye appeal and overall surface condition of a grade higher as it is lacking in any notable detracting blemishes. Value: The PCGS Price Guide has this coin valued at $19,000, although our example can be purchased via our Make Offer function for a $1,750 discount at $17,250. That is an extremely fair price point for an example of America’s Most Beautiful Coin that comes with a CAC Sticker. Why we love it: A scarce date in the Indian Gold Eagle Series that becomes especially rare as it approaches the mid Mint State range making this one of the last reasonably priced grade points. It comes from a low mintage of 59,000 coins, in which PCGS’s survival estimate is only one thousand. This bright yellow stunner has so much to offer aside from the rarity with its limited marks and its gorgeous, excessive luster. Value: The PCGS Price Guide value comes in at $12,000 and the CPG Value just above that at $12,700. Offered with a conservative reserve of just $9,500 in our auction this week and considering the beauty and rarity, we expect this coin to surpass that reserve amount easily. Why we love it: The 1919-D is an underrated tough date in the series that is extremely scarce with the Red designation in gem condition. Well-struck with gleaming reddish-orange surfaces, this brilliant gem is destined to be a highlight of a well-respected Lincoln Set. With the Red color-designation, there are just two finer examples graded at PCGS, which makes this the perfect candidate for an extremely high-end registry set. Value: There is only one past auction record of this date and grade combination that brought a strong $14,100 in 2016. That example was not even CAC approved and the PCGS Price Guide at $13,000 for this coin factors in zero premium of the CAC sticker itself. Our well-deserved CAC approved example can be acquired for thousands less than these two numbers at a best price of just $11,250 via Make Offer. Why we love it: An underrated Denver Minted date within the Saint Gaudens series, which deserves much greater attention given its scarcity. This near-gem piece displays stunning luster and ideal gorgeous yellow-gold coloring. 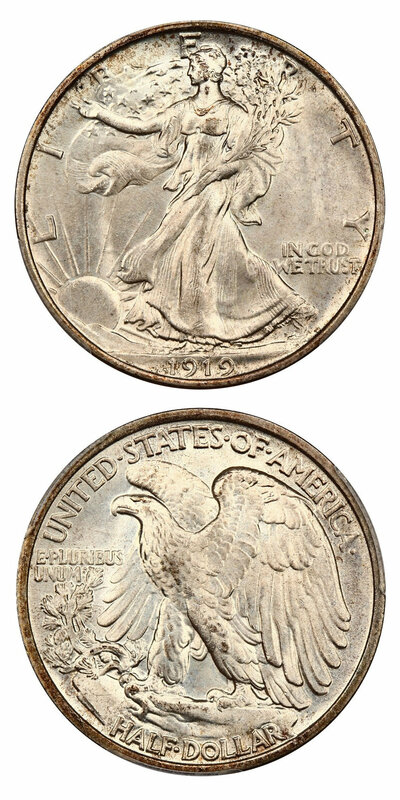 This key date Saint Gaudens Double Eagle issue features under one thousand surviving examples from its nearly 3-million-coin mintage in which PCGS graded only 14 finer than this example offered here. Value: The most recent sale of the same date and PCGS grade with no CAC sticker came in 2017 when that example brought $13,513 in auction. The PCGS Price Guide and CPG Value think so highly of this issue that they both evaluate thousands higher at $17,500 and $16,300 respectively. We are proud to undercut these estimates with a fair and generously low reserve of just $13,500 in this week’s auction. Why we love it: A popular and desirable Draped Bust Half Dollar type coin of the 6/Inverted 6 variety. 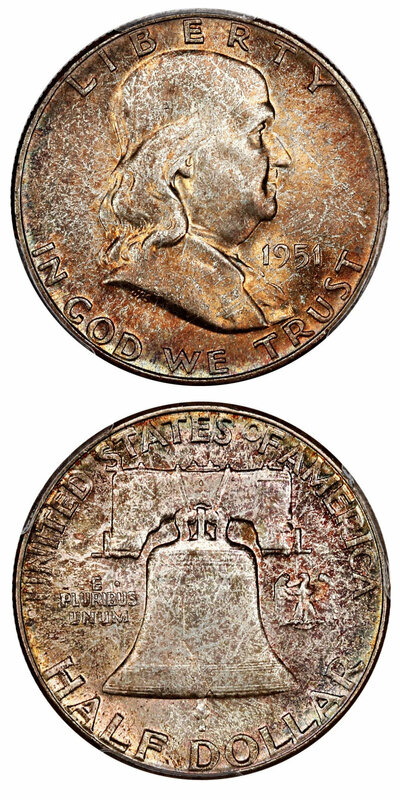 This coin displays nice naturally toned, well-struck surfaces that show subtle signs of wear. These characteristics make this piece seem nearly under-graded as proven by its well-deserved CAC approval. Value: The PCGS Price Guide value comes in at $4,750 and the CPG value at $4,380 with neither factoring in a premium for the CAC sticker. Offered with a conservative reserve of just $3,850 considering the CAC approval, we expect this coin to move quickly. This wholesome, choice XF coin is a fantastic candidate for an addition to an impressive Bust Half collection or set. Why we love it: A beautifully toned near-gem proof-only issue of the popular Twenty Cent denomination. The surfaces are high-end for the grade and CAC approved, and the eye appeal is captivating as the color from both sides of the coin includes pink and golden tints with flashes of lavender. This scarce proof 20-Cent piece comes from a low mintage of just 600 coins struck. Value: The two most recent auction records of this coin in PR64 both came in 2018 (Neither CAC) with one bringing a steep $6,600 and the other selling for $5,333 through our auction. The PCGS Price Guide and CPG Value both fall right in the middle of those numbers at $6,000 and $5,750 respectively. Even with a strong premium of CAC approval, we are still reserving this coin at the far low end of these other numbers at just $5,500 in this week’s auction. Why we love it: This is a popular and somewhat scarcer S-Mint issue from the Barber Dime Series. This pretty, lightly golden toned example features strong luster with pristine near-gem surfaces that show limited marks. The eye appeal is completely ideal as the quality and originality you’d expect from a near-gem is all there. Value: The PCGS Price Guide has a value set at $1,250 for this pretty near-gem Barber Dime without factoring in a premium for its CAC approval. Available for Make Offer at just $800, this fantastic Dime can be acquired for hundreds less than PCGS’s evaluation even with a CAC sticker. Why we love it: An ideal type coin for the Liberty Seated Half Dime Series with the Star-Obverse. This choice uncirculated example displays attractive surfaces that feature underlying luster and rich toning. The coloring consists of blue-green on the obverse and dark rose on the reverse. Value: Available for $275 via Make Offer, we think this is a great price for this type coin especially considering the unique color. The PCGS Price Guide has its evaluation set $40 higher at $325 further showing what an excellent value this is to fill in a hole in a Liberty Seated Half Dime Type Set. Why we love it: The perfect gem level type coin for the Liberty V-Nickel Series. This piece offers pristine surfaces that are covered in strong luster and lovely toning creating gorgeous high-quality eye appeal. The color is faint yet silky and smooth on the obvers and features a far more pronounced rose-gold spot on most of the reverse. Value: The CPG Value comes in at $715 with the PCGS Price Guide set a bit higher at $850. With a best price via Make Offer of just $625, this beautiful gem V-Nickel type coin comes at such a great value that it would make both a type collector or enthusiast of the series itself quite content in our opinion. Why we love it: A great type coin for any Bust Half Dollar type set at this price point. This piece is fully original with little visible wear and completely natural coloring. The characteristics of this coin’s eye appeal and surface quality are well reflective of the grade. 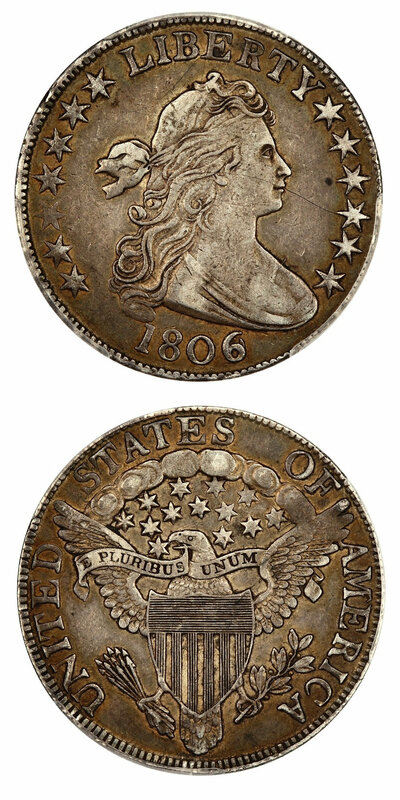 Value: Offered at $325 via Make Offer, we find that to be a fair price for this AU Bust Half type coin. The comparable estimate from the PCGS Price Guide of $400 further proves that our price point is a fantastic value for this affordable Bust Half that is ready to be added to a fine type set. Why we love it: A lightly gold tinted ultra-gem Full Bands example of this popular S-Mint Mercury Dime type coin. 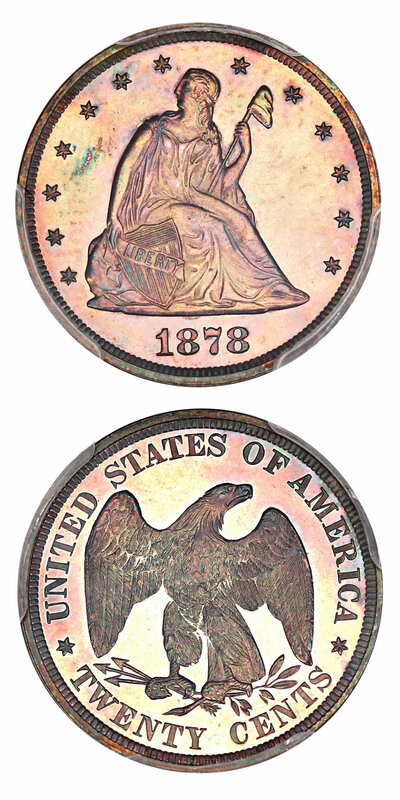 The faint silky coloring encases the coin. 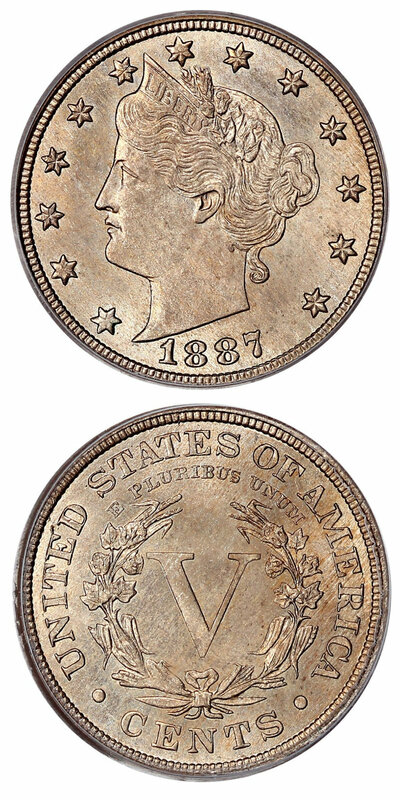 Other characteristics that make up this coin’s incredible eye appeal are its stunning luster and blemish-fee surfaces. 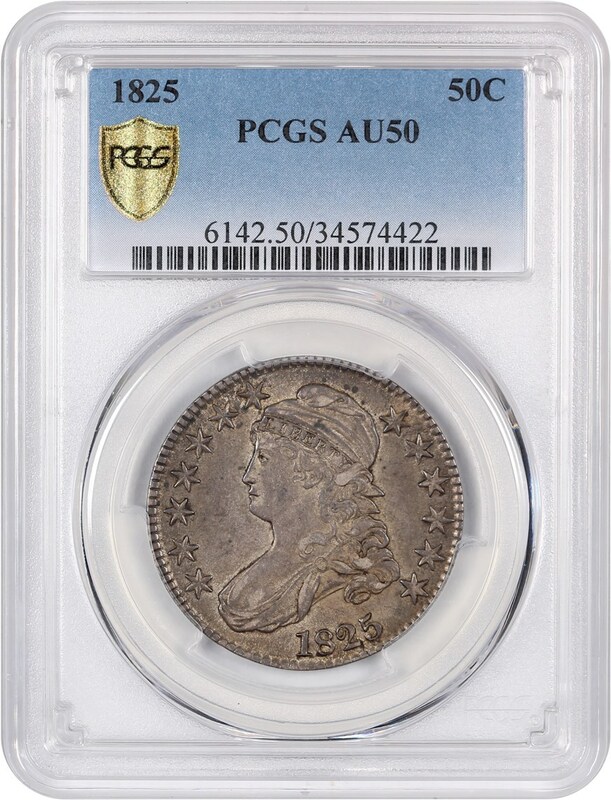 Value: With the PCGS Price Guide at $200, we have this NGC-graded example available for $170 via Make Offer. 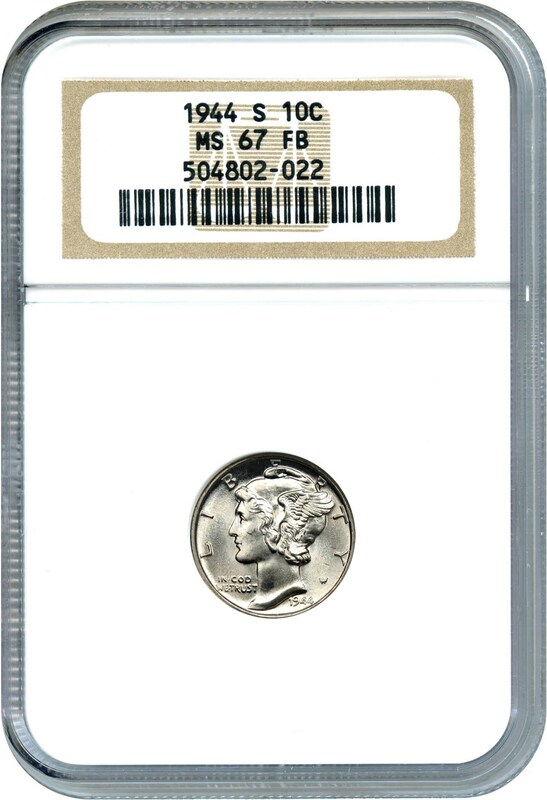 The price jumps by over $5,000 in MS68FB, and we think this is a great opportunity to own this gorgeous ultra-gem example of this popular Mercury Dime Issue at a fantastic value. Why we love it: A gorgeous toned example of this early Franklin Half Dollar that is a bit scarcer in nicer gem condition. This lovely gem displays strong underlying luster and pristine, well-struck surfaces. Between the lack of blemishes and fantastic eye appeal created by the luster and coloring, this coin is truly a high-end representation of the grade. The color features rich rose-gold on both sides with some subtle olive tones on the reverse. 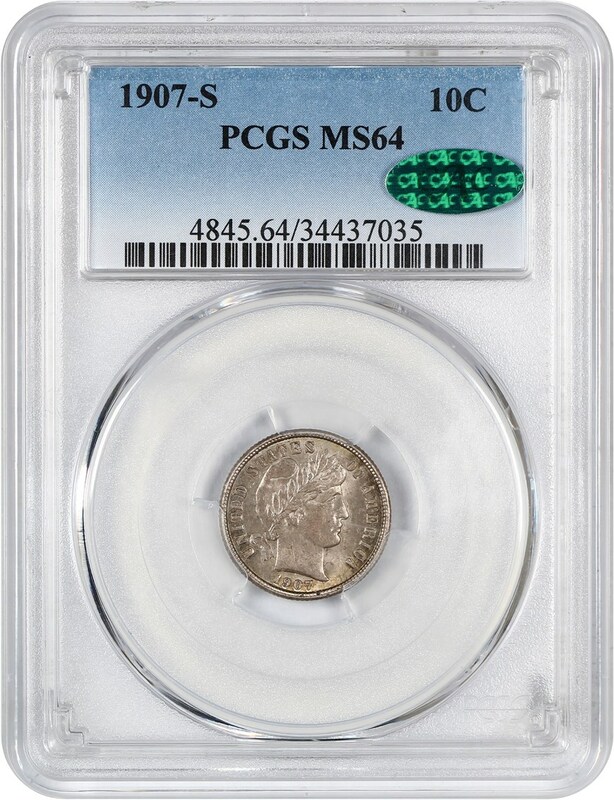 Value: The PCGS Price Guide has this coin valued at $225 in MS66 but it does have a CAC sticker, so it is also important to note an estimate of $1,300 in MS67. It is available for purchase at the excessively reasonable price of just $215 via Make Offer creating what in our eyes is an excellent affordable value. Auction #1060 Lots Posted. Browse & Bid Now! Auction #1059 Lots Posted. Browse & Bid Now!